India Tours - Real Experts. Independent Luxury Travel and Ultra Small Groups. 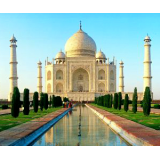 Easy Tours of India has 10 large offices in India to help you with your India Tour or India Vacation. The city of Agra stands Fatehpur Sikri, Akbar’s capital. Full credit goes to the Archeological Survey of India for this perfectly preserved example of a Mughal city at the height of the empire’s splendour. It is an attraction no visitor to Agra should miss. This walled city contains the mausoleum of the Sufi fakir, Saleem Chisti who is said to have granted Akbar and his Hindu queen Jodhabai their wish for a son. The main entrance to Fatehpur Sikri is through the 175 feet Buland Darwaza, the highest gateway in the world. It was built by Akbar to commemorate his victory over Khandesh in Gujarat. The photographs show some of the splendours of the fort city. One realises that since most monuments in India tours are made of sand stone, it is best to photograph them either during dawn or during dusk. Generally, 100 ASA film would do fine and in the summers and the afternoons you should keep the shutter speed high. If you are clicking at dawn or dusk, you would not require any filters either since the sandstone structures do take an identity of their own. In the first of the adjoining pictures you see a smallish building at dusk. This building at the north eastern end of the walled city is where Akbar founded his religion Din-e-Ilahi, which was an attempt in synthesising all major religions of the world. On the foreground you should be able to see some squarish markings. These markings were painted during Akbar's reign and form a huge chauparh (an ancient Indian game) board. Akbar is said to have played with human game pieces. 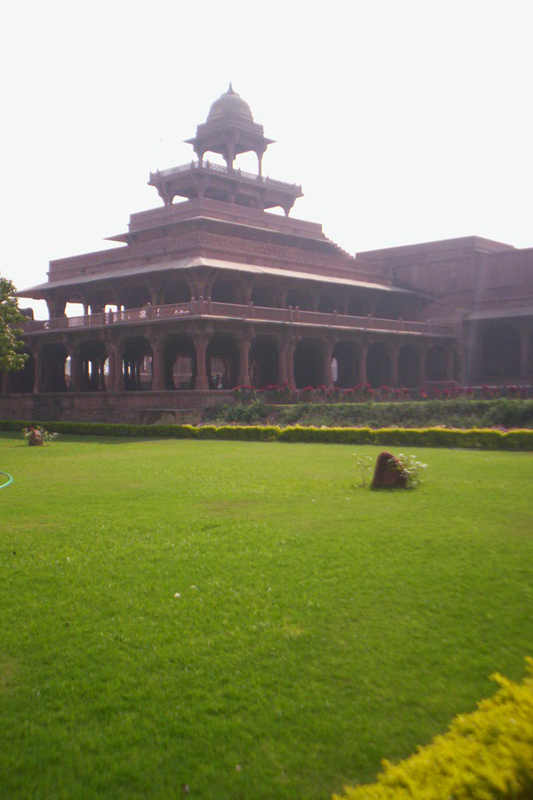 The Panch Mahal, a five-storeyed tower, the highest point in Fatehpur Sikri. This extremely airy tower is extremely is supposed to have been used by one of the emperor's many queens. The picture taken at dawn shows the western part of Fatehpur Sikri with the Buland Darwaza at a distance. A proper India tour through the walled city with an experienced guide, from the Bulund Darwaza upto the rear entrance and moat, would take about 3 hours. Just beyond the moat is an old bungalow, built in 1908 by the British. It is now used by the Archeological Survey of India.